Prometheus isn't limited to monitoring just machines and applications, it can provide insight for any system you can get metrics out of. That includes network devices, so let's look at how to monitor SNMP. If you visit http://localhost:9116 you can verify it's running. replacement: 127.0.0.1:9116  # SNMP exporter. If you wait a bit for some scrapes to happen, you can then visit http://localhost:9090/graph to see interface statistics. 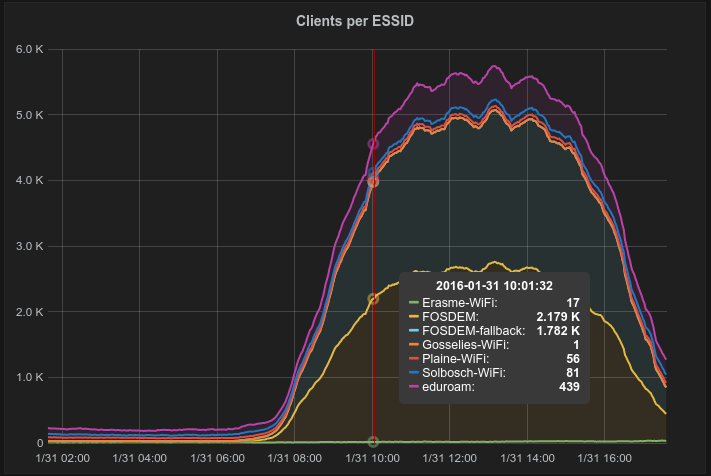 The SNMP exporter was deployed at FOSDEM last weekend, and we were able to produce a variety of useful dashboards in Grafana covering things like bandwidth and WiFi usage.